Klik på billedet og se alle billeder fra Villa Kaktus 2. Situated in Kas, a 12-minute walk from Big Pebble Beach and 1.7 km from Small Pebble Beach, Villa Kaktus 2 offers air conditioning. It has a garden, a terrace, sea views and free WiFi. Opening onto a balcony with mountain views, the villa consists of 3 bedrooms and a fully equipped kitchen. Both a bicycle rental service and a car rental service are available at the villa. 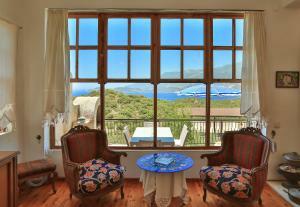 Kas Yacht Marina is 2 km from Villa Kaktus 2, while Kas Ataturk Statue is 2.2 km away.